In 2011, Worcester Polytechnic Institute (WPI) established a project center on Nantucket, where student teams pursue in-depth research that affect our island community. Since then, the Energy Office has co-sponsored a yearly study in island energy use and conservation. 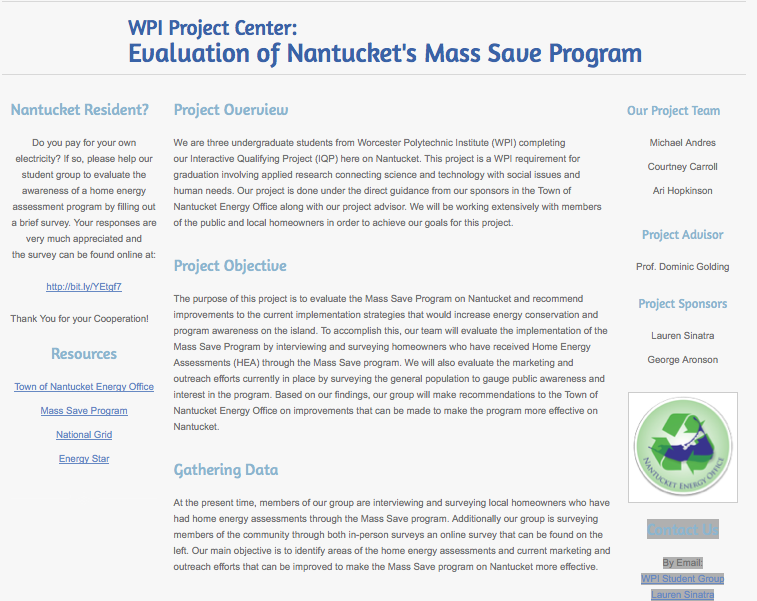 The goal of our project was to assist the Town's Energy Office in promoting the adoption of photovoltaics on Nantucket. The team conducted research, interviewed stakeholders, and distributed a survey to local residents to identify the current barriers to solar PV on Nantucket. The students also developed web-based promotional materials, including an interactive map, solar PV owner profiles, and a comprehensive list of FAQs, and recommended improvements to the permitting process. The goal of this project was to assist the Nantucket Energy Office by assessing the impacts associated with an increase of electric vehicles (EVs) on the island of Nantucket. This goal was achieved by surveying public opinion and gathering key stakeholder perspectives on EV charging and growth, and EV-based public transportation. Additionally, the project group assessed Nantucket’s electric vehicle charging infrastructure, usage patterns, and grid impacts. Based on the survey results and other findings, the project group developed policy and infrastructure recommendations for the Nantucket Energy Office. Among the recommendations were locations for public EV charging stations, awareness and outreach initiatives, and the further exploration of public EV transportation on Nantucket. From October 26 until mid-December 2015, the Energy Office sponsored and served as project advisor to three undergraduate engineering students from Worcester Polytechnic Institute. This project will be the fifth research project that the Energy Office has sponsored in recent years, focused on local energy issues. ﻿﻿Purpose: To provide key research, recommendations, and deliverables—based on local interviews, surveys, and lessons learned from the City of Worcester’s smart grid pilot project and local Sustainability Hub—to support the Town of Nantucket Energy Office and National Grid in their efforts to increase the public’s energy awareness and participation in local energy programs designed to save Nantucket residents and businesses energy and energy-related costs, such as Municipal Aggregation and the “Non-Wires Alternative” (NWA) pilot project to reduce summer peak load and defer the need for a third undersea transmission cable. In recent years, Nantucket’s demand for electricity has increased significantly. On July 23 2013, Nantucket’s energy usage hit an all-time high: 45 MW, a 12.5% increase from the previous record high of 40MW in 2012. National Grid, the island’s sole electric utility, has determined that Nantucket’s demand for electricity is growing more than five times the Massachusetts state average. As a result, there is a growing concern about the need for additional, costly and disruptive infrastructure--namely a 3rd undersea transmission cable, which may come at a tremendous expense to Nantucket ratepayers. Energy Efficiency Charge (1.004¢ per kWh), to fund the Mass Save program, which equates to about 1.46 Million dollars/year from Nantucket ratepayers. Currently, Nantucket is only receiving 17% back of this funding for energy efficiency investments. While the reality of the need for a 3rd cable on Nantucket is still uncertain, there is much that can be done to reduce electricity costs and improve the overall energy efficiency of the island’s residences and businesses. Not only is the Town investigating Municipal Aggregation to potentially reduce electric rates, but has teamed up with National Grid on a special 5-year “Non-Wires Alternative” (NWA) pilot project to investigate whether customer-side technologies can be implemented in a targeted way to achieve sustainable load reductions, possibly reducing the amount of backup diesel generation needed and potentially deferring any future plans to construct a 3rd cable. The Project was launched in 2015, with the initial phase focusing on a set of “exclusive” energy efficiency incentives for Nantucket customers. "Decorative Streetlamp Inventory & LED Pilot Project"
Final presentations can be viewed here! ﻿The Town of Nantucket owns nearly 200 decorative streetlamps, which are located throughout the island of Nantucket, primarily in the downtown historic core and in the village of Siasconset. In fiscal year 2014, the Town paid $14,250 in electricity bills, as well as approximately $36,000 in maintenance and repair costs. Currently, there is no established system for keeping an accurate inventory of the Town’s streetlamp locations, conditions, nor maintenance history. In fact, many streetlamps are missing their identifying numbers completely. Streetlamp outages remain a constant issue to manage by both Town Administration and the Department of Public Works. Throughout the year, concerned residents and business owners will frequently report non-functioning streetlamps to the Town via phone calls, emails and the SeeClickFix App. However, when streetlamps are reported as non-functioning, the process to trouble shoot and eventually fix the streetlamps is complicated and inefficient. Currently, under the S-3 Option B tariff, National Grid is obligated to troubleshoot and replace the streetlamp photocell sensor and bulb and to test that power is present at the base of the streetlamp. All other repair work is assigned to Ryder Electric (Town’s contracted electrician). However, at this time, neither National Grid nor Ryder Electric is consistently communicating to the Town of Nantucket about key details about the repair work performed at each streetlamp, and as a result, many streetlights have yet to be fixed. When the streetlamps are fully operational, they emit a warm diffused light that many would agree enhances the aesthetic appeal of the surroundings; evoking the sense of an earlier era. However, faced with rising electricity costs, the frequent tendency for lamps to “go dark,” and a civic duty to help reduce Nantucket’s peak electricity load*, the Town of Nantucket would like to further investigate the social and economic feasibility of an LED conversion project. As is the case with any community-wide project, an LED retrofit project should provide an opportunity for public input. Installation of demonstration sites and photo documentation of individual lights before and after changing to LEDs may help to answer residents’ questions and illustrate the benefits of the new technology, such as: reduced maintenance costs, decreased light pollution, decreased light trespass, and enhanced visibility and performance. 1-Page Summary of Project, Results & Recommendations. The purpose of this project is to assist the Nantucket Energy Office in promoting responsible energy usage on the island of Nantucket by tracking and measuring the energy consumption trends of Town departments. With the help of the MassEnergyInsight tool, our team will analyze liquid fuel and electricity use by municipal facilities to track consumption trends, identify instances of efficiency and inefficiency, and generate reports, graphs and other informational visuals that can be used to inform municipal employees about their energy use. We will also conduct on-site interviews to assess town employees’ attitudes towards energy conservation. From this, our team will make recommendations to the Nantucket Energy Office and other town department heads on how to best rectify instances of inefficient energy use by Town employees. Update the MassEnergyInsight Tool with complete and accurate energy data for municipal accounts on Nantucket. Identify instances of inefficient energy consumption amongst Town facilities, and measure energy savings from previously implemented energy efficiency projects. Determine municipal employee attitudes towards energy conservation and efficiency. Make recommendations to the Nantucket Energy Office and Town Administration about how to implement the SEE the Light Energy Toolkit to encourage energy conservation by Town employees within municipal buildings. WPI Student Research Team completes final report "Evaluation of the Awareness & Effectiveness of the Mass Save program on Nantucket!" CLICK HERE to read about their interesting findings.